This has been a significant week for the school community with a real focus on values. Fundamental values of democracy, rule of law and equality featured prominently at Monday’s visit to the Houses of Parliament and Cabinet War Rooms by the Year 7 students. The group returned to QHS to enjoy a spectacular fireworks night attended by a large number of pupils, parents, staff and members of the local community. It was certainly positive to welcome the local residents living on the outskirts of the school who demonstrate excellent tolerance and understanding for the traffic of parents and school buses. An assessment of the development of society was also a feature for our Junior School pupils this week as they enjoyed dressing in their costumes and experiencing life in the Stone Age or Roman times. On Thursday evening the school was recognised as a national finalist in the parent engagement category at the ISA Awards Dinner. The school benefits greatly from the widespread support of our parent community and we look forward to this coming week’s Early Years activity of Spotty Bingo on Friday afternoon as we share in the national effort to raise funds for Children in Need. Next week is national Anti-Bullying Week and we all have the opportunity to show our desire to attend a school free of any form of bullying behaviour by wearing odd socks on Monday. Our pastoral teams work extremely hard to ensure that we provide students with a caring and supporting environment where all are equally valued within the school community. All children should be thinking carefully about their behaviour at the end of a week when the national focus has been on the centenary of the end of World War I. I am pleased that our Year 9 & 10 students will have the opportunity to visit the actual battlefields and war cemeteries in the Spring Term in our annual excursion to Ypres, Belgium. All pupils and staff have the name of an individual fallen soldier from Northamptonshire in their pocket to carry around with them next week as we each remember and respond to the sacrifice that was made on our behalf. Stories in assembly provided real details of devastating loss for so many families and friends within our locality. We welcomed residents from Hawthorns Retirement Living to our assembly and recognised the lives of members of their own families lost in service of the country. 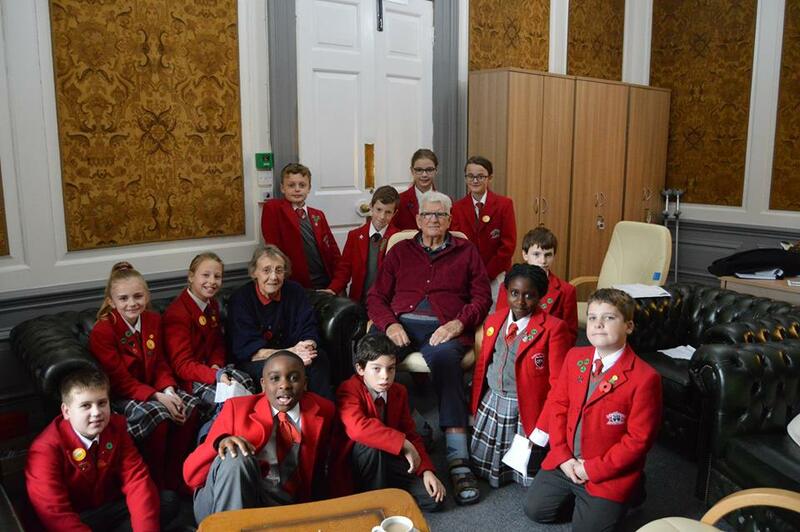 Individual pupils brought an awareness of the contributions made by their relatives and interviews with our senior citizen visitors following the service allowed Year 6 children to learn of young lives living with rations, clothing coupons, dried foods, the corner shop, blackouts, bomb shelters in gardens, evacuation and fathers away from home. As Headmaster I make no apology in remembering every year the life of Joe Whitaker, a student I taught at Warwick School and tragically killed serving with the paratroopers in Afghanistan as a young man of 20 years of age. Miss Cheney was a close personal friend of Joe at university and provided a moving tribute to Joe in this year’s assembly. Our Early Year’s children made wonderful poppy wreaths and ceramic poppies, sixth form students Tatiana and Beth provided a Wilfred Owen Poem, and Noah Poole played the Last Post and Reveille as we concluded our assembly with two minutes silence. Each pupil simultaneously read out the name of their fallen soldier as we remembered them in our closing prayer. The challenge for us all is to respond with appropriate actions to the words and sentiments of the service.